A young Venezuelan man is standing near the border bridge where the military has created a barricade and is urging troops to accept humanitarian aid. Twenty-two-year-old Jose Mendoza stood at the entrance to the Colombian side of the Tienditas International Bridge Wednesday holding a sign that says, "Humanitarian aid now." 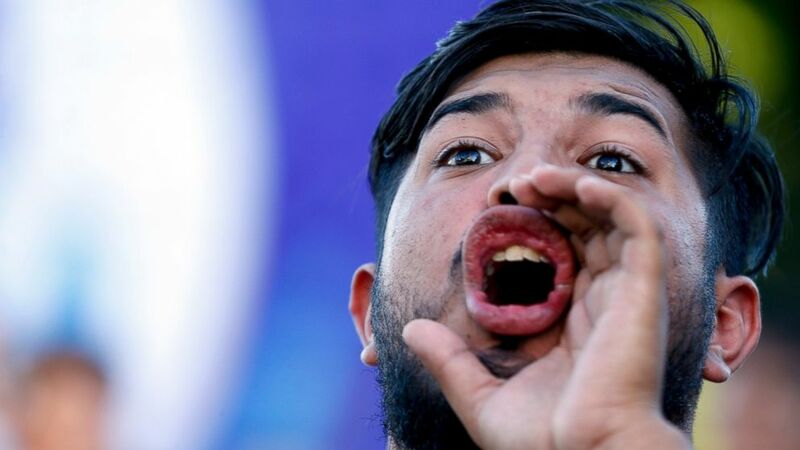 Mendoza says he is tired of seeing Venezuelans suffer from food and medical shortages and that the military should stand on the side of the people. He wants troops to think about their own families as they decide whether or not to accept the aid from the U.S.
U.S. officials say the first truckloads of emergency food and medicine destined for Venezuela have arrived in Colombia. He posts photos of boxed up supplies wrapped in plastic and stacked on trailers. It lands amid a political standoff between Venezuelan opposition leader Juan Guaido, who asked for the international assistance, and President Nicolas Maduro, who rejects it as part of an U.S.-led coup. Maduro's military has barricaded a bridge between Venezuela and the Colombian border town of Cucuta, a potential crossing point. U.S. Secretary of State Mike Pompeo says in a stern tweet that Maduro must let the food through to Venezuela's starving people. U.S. Secretary of State Mike Pompeo is demanding that Venezuela's embattled President Nicolas Maduro stop trying to block humanitarian assistance from entering the country. Pompeo tweeted Wednesday that the United States and other countries are sending emergency food and medicine to help desperate Venezuelans. Tensions are high for a third week since opposition lawmaker Juan Guaido announced he rightly assumed the presidency, vowing to oust Maduro and restore Venezuela's democracy. The Venezuelan military has barricaded a border bridge with Colombia in an apparent attempt to block the emergency food and medicine. He says the "Maduro regime must LET THE AID REACH THE STARVING PEOPLE" of Venezuela. The aid squabble is now the latest front in the battle between Guaido and President Nicolas Maduro, who is vowing not to let the supplies enter the country. Maduro argues Venezuela isn't a nation of "beggars" and has long rejected receiving humanitarian assistance, equating it to a foreign intervention.